The SIMATIC Industrial Tablet PC taps new application areas within the scope of Industry 4.0. Designed for industrial use, the SIMATIC ITP1000 can convince with its many functions in day-to-day working. Typical applications are in maintenance/service, production and measuring and testing. 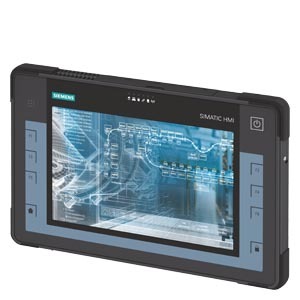 The SIMATIC Industrial Tablet PC takes the performance of SIMATIC industry PCs to the tablet format. With a large number of functional expansions such as a 1D/2D bar code reader or user identification by RFID, it taps diverse possibilities of use. The entire construction is designed for industrial use, be it high temperature in continuous running duty or industrial EMC requirements. High component continuity and guaranteed availability of spare parts for up to 5 years after product phase-out are ensured, e.g. through the development and production of our own motherboards. This enables long-lasting machine concepts without renewed engineering effort. Thanks to the full-fledged Windows operating system, the SIMATIC ITP1000 is easy to integrate into the existing IT Infrastructure. Thanks to the notebook CPU used, the SIMATIC ITP1000 is a fully fledged PC, which can be turned into an office workstation using a docking station. Mobile applications on tablet PCs give rise to new application possibilities. A wide range of options (RFID, bar code reader, camera) provide a tailor-made solution for your industrial application. Typical application areas are to be found in service/maintenance, within the scope of Industry 4.0 ("paperless factory"), for production planners, power data management or, for example, measuring and testing tasks. The SIMATIC ITP1000 is a table PC with high computing capacity.